Motorola DTR radios are very popular 900 MHz digital radios that are also license free. The DTR600 is the newest edition to the DTR series and replaces both the DTR410 and the DTR550. It is compatible with all other DTR series radios as well as Motorola's DLR series radios. In this video, Danny introduces the new Motorola DTR600 digital two way radio and provides an overview of its features. The Motorola DTR600 is available now from Buy Two Way Radios. Watch our video programming tutorial! 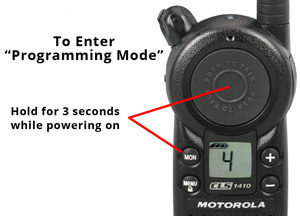 How to program the Motorola DTR600 and DTR700 digital radios will show you how to do it yourself! This entry was posted in Videos, Business Radios, Motorola and tagged Motorola, 900 MHz, video, DTR, digital radio, DTR600, DTR700 on January 30, 2019 by Rick. Enter the door of a local retailer these days and you are likely to see the staff using two way radios. From small mom-and-pop shops to big box stores, from the front register to the back storeroom, two way radios are used by merchants every working day, and it's easy to understand why. Communication is vital to any business operation, and radios provide instant communications between management and staff for lower cost of ownership and increased ROI. The faster response time improves efficiency, productivity, security and the overall customer experience. A two way radio system is a much more efficient way to communicate than using cell phones, and at a fraction of the cost. When it comes down to the bottom line, choosing two way radios for a retail operation simply makes good business sense. Radios are a perfect fit for a retail store, and work very well in such an environment, but there is one model series that overshadows the others and is particularly popular with merchants. The next time you visit your favorite retailer, take a close look at the radios worn around the store. It is quite likely the radios they are using were made by Motorola. But they may not be just any Motorola. Chances are, you will find that the clerk behind the counter will be using a Motorola CLS1110 or CLS1410 on-site business radio. Motorola CLS Series radios are the de facto favorites among retail merchants and their staff. The CLS1110 and CLS1410 seem to be a sort of standard among both small and large retailers, and for a number of very good reasons. They have great range indoors. Although quite small, the CLS1110 and CLS1410 provide considerable coverage in retail environments. The CLS radios operate on licensed UHF frequencies, which are good for indoor applications, especially in small retail stores with multiple aisles of obstructions such as shelving and inventory. They are good indoor radios, and are specifically designed for that environment. They are small and discreet. These are two of the most compact and ergonomic business radios on the market, which makes the Motorola CLS Series perfect for retail use. Employees tend to move around a lot within the confines of a store and such mobility requires them to carry a radio that is extremely compact, light weight and unobtrusive to the customer. Since many shops don't need a lot of range, it makes sense to go with the smallest radio possible. The CLS1110 and CLS1410 fit the bill perfectly. Motorola CLS radios are designed for efficiency and comfort. 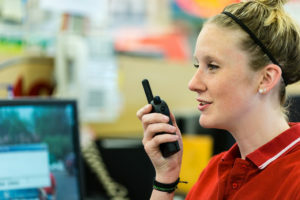 A typical retail operation requires staff to carry or wear their radios for the duration of their shifts. A full-sized handheld business two way radio can be heavy, bulky and cumbersome to carry around for long periods. Not so with the CLS series. Motorola designed these radios for retailers with ergonomic portability in mind. According to reviews, Motorola hit the mark, as merchants and their employees find them comfortable to carry, hold and wear. The CLS1110 and CLS1410 operate on 56 business frequencies. These are preset in the radios, which makes programming a breeze. The radios are front panel programmable, and features can be configured or customized in a few simple steps. The CLS radios can also be easily cloned using the optional multi-unit charger, making the process of configuring a whole fleet of them easier and very fast. The CLS1110 and CLS1410 are designed for simplicity, so an employee can instinctively operate them with little to no training. The Large PTT (Push-To-Talk) button is located on the front face of the radio at the top, allowing the operator to quickly and easily find and press it by feel, without having to look. The front panel has only four other buttons and a simple LCD display with icons that are easy to recognize and understand, even for the layperson. The CLS radios are much simpler to use than a cell phone and provide instant communications at the push of one button. The CLS radio also comes with a holster, and is designed to slip in and out of it quickly, securely and with ease. They are built for daily use. Motorola CLS radios are made to withstand the rigors of daily operation in a typical retail environment. While not impervious to abuse, these units can take a modicum of wear and tear during a long shift under normal working conditions. They meet Military Standards C,D,E,F, and G for shock, dust and vibration. They are also rated IP5X to handle up to a 5 foot drop onto concrete. The CLS1110 and CLS1410 are made to last awhile, and come with a two year warranty against defects in materials and workmanship. There is a huge selection of accessories available for them. Although these radios can be used with the built-in microphone and speaker, many retailers prefer to use them with earpieces or headsets for greater privacy and more discreet communications between employees, especially when used on the floor around customers. Fortunately, there is a plethora of OEM and after market accessories available for the CLS1110 and CLS140. Such a wide selection gives the merchant and their employees greater flexibility to communicate, increasing efficiency and productivity in their entire retail operation. The Motorola CLS Series radio fits any retail workplace and integrating naturally into the workflow to provide instant continuous communications for on-site retailers, with no monthly fees, no service charges, and no contracts. After all, the faster the better the communications, the more cost-effective, efficient and profitable the operation. Considering all this, it's no wonder the Motorola CLS1110 and CLS1410 are a such popular choice for retailers. It's not trendy, it's just good business. This entry was posted in Articles, Business Radios, Motorola and tagged Motorola, CLS1110, CLS1410, retailers, radios for retail on January 18, 2019 by Rick. This entry was posted in Videos, Ham Radios and tagged Leixen, VV-898P, VV-898SP, Mobile Radio, backpack radio on January 16, 2019 by Rick.